Our black tank in the RV is plugged up in the toilet tank. We bought one of those back-flushing devices and back washed the tank several times. We took a snake and ran it as far as it would go from the toilet side and still the tank will not drain. The snake seemed to just coil up. Is there something else we could try? What is the best method for thorough cleaning out of the sewer holding tank? Maybe like a pump or a back-wash system or an inside flush system? Randall and Darryl, if I had to pick just one area where I feel RV manufacturers have let us down, I would have to pick the waste management system. And it extends beyond the limits of the sidewall of the motorhome as well. I also believe the importance of this subject has long been under-evaluated so please allow me to indulge myself for a minute or two. We can all agree that waste managementis probably the least appealing aspect to the RVing lifestyle. But to enjoy the total freedom RVs give us, it is something we must endure. Thankfully, many RV coach builders have just about mastered the waste containment part by going to full-flow 3-inch outlets on all tanks, including the gray tank, improving the venting, adding better, non-invasive, monitoring systems and installing electric termination valves at the container outlet instead of a manual valve at the end of a long drain pipe. These additions to waste systems have generally made containment and evacuation easier and much safer. And safety is the key when it comes to the health and well-being of RVers! Just ponder the many bacteria, viruses and other disease-carrying critters that must thrive within the holding tanks and termination assemblies of our coaches. But, a serious problem lies between the termination assembly on your rig and the inlet to the dump station or sewer connection at the campground. That gray area (no pun intended), is not governed by any standard! Both entities, the RV manufacturer and the campground, leave that totally up to the discretion of the RV owner. Think about it, that portion of waste transfer, the most vulnerable to spillage, leakage, contamination and disease, is left to the end user; in many cases, a novice RVer with little or no experience in the correct methods of evacuation and transfer. Here’s what’s baffled me for some time: The RV itself must conform to rigid standards of design and construction and the RV campground must conform to the standards of sewer design and construction, yet the crucial link between those two is not even considered. So your questions are good ones. Let me begin by stating that these are just the opinions of one lone RV Doc and that certainly other solutions may exist. My “best method” starts with using the proper sewer hose. I recommend sewer hoses made from polypropylene (PP) or polyvinylchloride (PVC); the thicker, the better. Look for hoses 32 mil thick or thicker. I’ve field-tested thermoplastic hoses 40 mil thick and those are the best. Avoid hoses made from vinyl. They are prone to pinhole leaks and simply do not last as long as those constructed of thermoplastics. Vinyl hoses also have a tendency to “spring back” to its collapsed/relaxed condition whereby it seems you’re constantly fighting against it to get it connected. The PVC hose, on the other hand, contains an inherent memory and needs only to be extended to the length needed to make the connection.This provides the least resistance to the materials flowing through it during evacuation. I’m also a firm believer in allowing both holding tanks to be filled to above 3/4 full before emptying; the fuller, the better. The more force you have behind the evacuation, the less chance you’ll have of leaving contents behind. Any residual build-up in the bottom of any holding tank will eventually grow to become a blockage. I’m guessing this is your situation Randall. You’ll notice I said “both” holding tanks above. 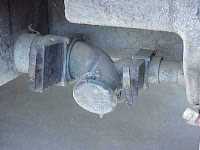 Many RVers are instructed to leave open the termination valve for the gray tank and simply let it drain continually while connected to the campsite sewer inlet. This practice will leave behind residue that will dry out and lead to odors and possible blockages. That’s right; holding tank odors can emanate from the gray tank as well as the solid waste tank. Fill them both and then evacuate when near full. Additionally, leaving the gray tank valve open all the time disrupts the sewer venting balance within the campground sewer system itself. Ever notice a waste odor while strolling through the campground? With open gray valves, the campground now has multiple vents (individual motorhomes) spewing odors closer to the ground via the gray vents on the RV. It’s common practice to dump the black tank first, then the gray tank in order to help rinse the solids out of the termination piping and sewer hose. Continue to do this. I also recommend, where practical, to flush each tank with lots of clean fresh water to help rinse away any particles left over after evacuating. You cannot use too much fresh water in this step. My final recommendation is one you’ll have to sub out. Locate a dealer offering the cleaning services of All Pro Water Flow. This company employs high pressure hydronics (500 – 3,000 PSI) for cleaning the entire interior of each holding tank. Macerators and pumps may allow holding tanks to be evacuated faster while RVing, but the results will not likely be cleaner or more thorough than liberal amounts of high pressure water spraying the entire interior surface of each tank once or twice a year (depending on use). For those holding tanks with internal monitor probes, this process will eliminate those erratic tank readings also! Randall, this service will eliminate your current condition. Since the advent of this service, I no longer recommend the back-flush method wherever possible. Tests have proven that back-flushing is not effective considering the time it takes to do it correctly. Back-flushing, however, is still better than doing nothing at all. It’s my recommendation though to keep all fresh water components far away from any waste system components. So if you back-flush, use a dedicated water hose and stow it with the sewer hose to avoid any confusion between it and the fresh water hose used for the city water connection. Another new entry in the aftermarket that will eliminate false monitor panel readings caused by fouling of the in-the-tank probes are the Horst Miracle Probes. So by starting with good equipment, filling each tank to near-capacity, evacuating fully and flushing out each tank after evacuation and annually having high pressure hydronic cleaning performed,you’ll both be practicing the “best” method of holding tank cleaning possible.